UCF alumni will present UCF President Hitt a petition urging him to grant UCF Faculty a More Than 1 percent raise at the annual UCF Board of Trustees (BOT) Meeting, Thursday, January 23rd, at the Live Oak Event Center from 1:00-4:00. The petition was created by a UCF alumna and has gathered overwhelming support from UCF alumni, UCF faculty, and Orlando community members at large. The petition addresses UCF Faculty’s yearly decline of take home pay, UCF faculty’s right to a fair wage increase, and the outcome of November’s Impasse hearing. UCF Faculty supporters shared their reasons for signing the petition and supporting the More Than 1 percent raise, in the comments section of the petition. UCF alumni hope the full Board of Trustees will overturn the Labor and Compensation committee’s recommendation for a 0.5% raise and will do the right thing and grant faculty a More Than 1 percent raise. 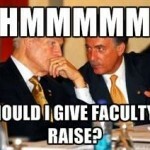 The average raise package for faculty at other Florida universities this year is over 2.5%. This entry was posted on Wednesday, January 22nd, 2014 at 10:00 pm. It is filed under Blog, Featured. You can follow any responses to this entry through the RSS 2.0 feed.